American film director Wes Anderson's animated film Isle of Dogs opened the festival, becoming first animated film to open the fest. The Romanian film Touch Me Not directed by Adina Pintilie won the Golden Bear, which also served as the closing night film. Adina Pintilie with Golden Bear at Berlinale 2018. Crystal Bear for Best Short Film, Generation KPlus Section - A Field Guide to Being a 12-Year-Old Girl by Tilda Cobham-Hervey. ^ "Berlin Film Festival to host retrospective of Weimar-era films". Screen. Retrieved 30 November 2017. 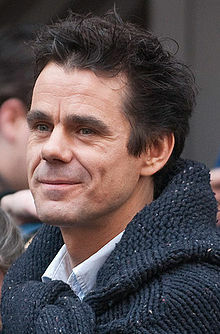 ^ "Tom Tykwer to chair the jury of the 68th Berlin Film Festival". Cineuropa - the best of european cinema. Retrieved 30 November 2017. ^ "Berlin Opening Night: Wes Anderson, Tilda Swinton, Greta Gerwig Celebrate 'Isle of Dogs'". Variety. Retrieved 18 February 2019. ^ "Romanian film about fear of sexual intimacy wins Golden Bear at Berlin film festival". The Guardian. 25 February 2018. Retrieved 25 February 2018. ^ a b "The International Jury 2018". 6 February 2018. Retrieved 6 February 2018. ^ Chu, Henry (2 November 2017). "Tom Tykwer to Preside Over 2018 Berlin Film Festival Jury". Variety. Retrieved 30 November 2017. ^ "Gus Van Sant's 'Don't Worry' Among First Berlinale Competition Titles to Be Unveiled". Variety. 18 December 2017. Retrieved 22 December 2017. ^ "Press Releases: Competition 68th Berlinale". Berlinale. 18 December 2017. Archived from the original on 22 December 2017. Retrieved 22 December 2017. ^ "Press Releases: 68th Berlinale". 15 January 2018. Archived from the original on 17 January 2018. Retrieved 16 January 2018. ^ "Press Releases: 68th Berlinale". 22 January 2018. Archived from the original on 23 January 2018. Retrieved 22 January 2018. ^ a b "Competition and Berlinale Special Are Complete". 6 February 2018. Archived from the original on 7 February 2018. Retrieved 6 February 2018. ^ a b "Panorama 2018: Disobedience – "Body Politics", Resistance to Machismo, and a Strong Showing from Latin America". Berlinale. 15 December 2017. Archived from the original on 29 January 2018. Retrieved 29 January 2018. ^ a b "Programme for Berlinale Panorama 2018 Complete: What's Your Poison?". Berlinale. 25 January 2018. Archived from the original on 29 January 2018. Retrieved 29 January 2018. ^ Berlinale.Archive. Prize winners 2018. ^ "68th Berlinale: Awards of the Ecumenical Jury". 26 February 2018. Retrieved 27 February 2018. ^ "Prizes & Honours 2018". Berlin Film Festival. Retrieved 2 April 2019. Wikimedia Commons has media related to 2018 Berlin Film Festival.